The solution, every solution, rests with the US Government. Not with the private sector. Because of Power. And because of The People. You and me. The Left have been frustrated at most every turn recently because the bulk of The People do NOT want illegal immigrants storming their country. The People do NOT enjoy being strangers in their own country, surrounded by people who do not speak English. The People do NOT want hot-and-cold running abortions on demand, and do NOT want their children pulled out of school for a trip to Planned Parenthood or a secret abortion. They WANT judges and justices who abide by the Constitution and do not legislate from the bench. They WANT fiscal responsibility. They WANT their country sovereign and secure, and answerable to THEMSELVES and NOT any global body. So the Left knows that it won't acquire its goals and enable its ends at the behest of The People. Therefore, The People cannot be relied upon. Privatization cannot be relied upon. Only The Government (and specifically the Federal Government) will enable their ends. The Government in terms of what the Left legislates via the Demorats. Realize: this is the true nature of the Left and why they do what they will. Because The People won't let the Left enable their wishes, The Government must be the true repository of Power, and The People must be beholden to The Government. UNDERSTAND: THAT is why it is IMPERATIVE that the GOP keep the Presidency. Not because the President can rule on abortion or any number of other issues -- but because the POTUS can CHOOSE Supreme Court justice replacements. The Left via the Demorats: their sole purpose is to CIRCUMVENT the will of The People. Further, this from the Global Politician magazine, which indicated the Ten Postulates of Political Correctness. I would take that one step farther: these are the Ten Tenets of Leftist Religion. This is exellent, BZ. I wonder if the majority of American voters truly understand exactly how important the Supreme Court is in this country. I have my doubts. It is, in my opinion, THE most important aspect of the coming (or any other, for that matter) Presidency -- and hypercritical now that we know and recognize how Demorats purposely circumvent the will of The People. brilliant post!..immigration.........sigh..I've grown weary of shouting about it BZ! 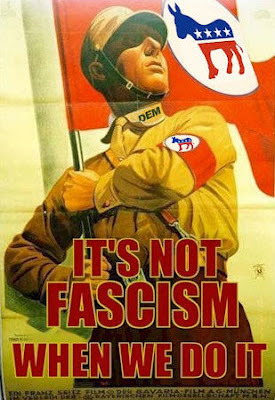 Actually, if you read what Mussolini actually believed and did, one would recognize that the modern Democrats are practically modeling themselves after him. They really are Fascist. I very much enjoyed the graphic I placed, quite frankly, due to its complete applicability. Gayle: thank you; I get tired of keeping the same avatar. Good post. Especially the tenants of the left. Thanks for reminding us about the issue of appointments to the Supreme Court. You are right!